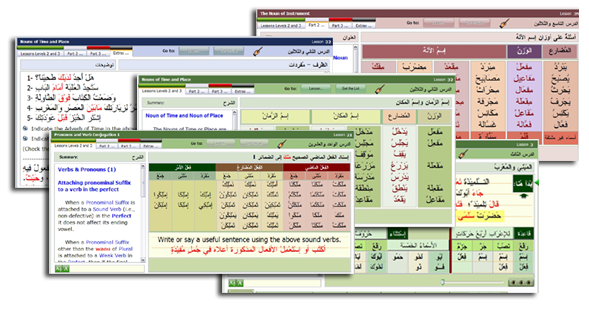 Advance your Arabic language acquisition with this forty-four audio-visual, bilingual, rich study materials and examples with easy to follow grammar lessons, also featuring standard navigation and controls you find accross the twenty-four layers of eArabic Pro 6.0 MSA software program. By completing this section, the student would have acquired extensive academic knowledge of the Arabic language, including comprehension, vocabulary, speaking, grammatical, and writing skills. Such success should testify to his or her seriousness in achieving their goal by completing the curriculum, and such will bear advantageous results in the work field, or even when learning Arabic for personal use. Always link the study materials in these two sections of Arabic grammar to the Quick Grammar Tips section. Thereat, the student will find ample examples and extensive details that can enhance one's command of the Arabic language. Click on the Quick Grammar Tips in the list for more details.